Deadline to register is Wed., Feb. 6, 2019. Ms Prather have worked with Bank of America firm for 9 years. She was recruited to join the firm as a Relationship Manager and later was recruited in the Home Loans/Consumer Lending line of business. Ms. Prather work daily with clients to meet their home ownership goals and dreams. She studied Education at the North Carolina State University, of which during that time decided to go another direction. She is married to her high school sweetheart and they have three amazing children. Keith Corbett’s work focuses on eliminating abusive lending practices at the state and national levels. 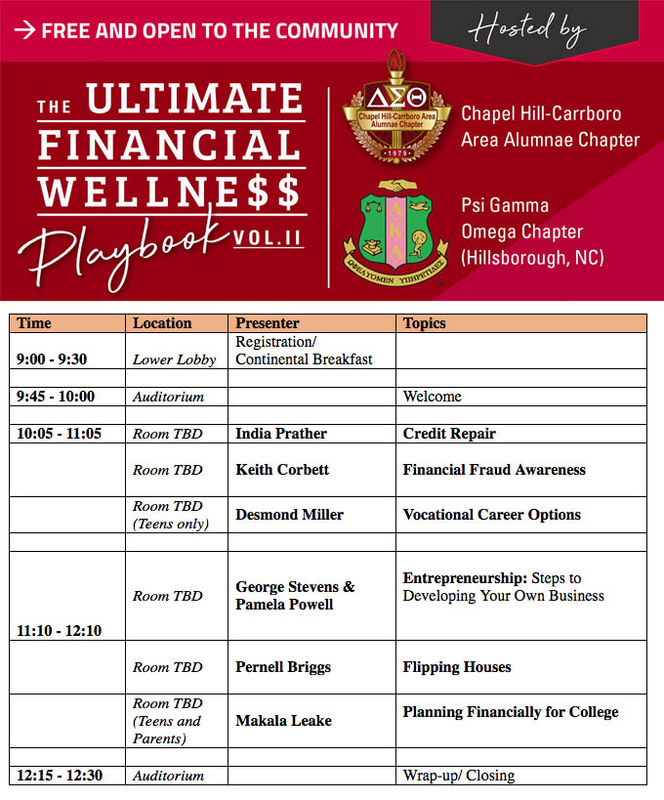 Prior to joining Self-Help, he worked for 21 years in banking and insurance, serving as vice president and treasurer of North Carolina Mutual Insurance Company. In 1998, Dollars & Sense Magazine voted him “Best and Brightest in Finance.” Keith is a board member of the Financial Protection Law Center and treasurer for the National Baptist Convention, USA Housing and Economic Commission. He is the treasurer for the North Carolina State NAACP, and a member of the National Association of Realtors and the North Carolina Association of Realtors. Keith holds a BS and MBA in Finance from North Carolina Central University, and enjoys fitness, golfing and swimming in his spare time. Ms. Powell’s vision of Christian Prep Academy, is to offer a well-rounded curriculum that fosters positive spiritual, academic , physical and emotional development in each child. Ms. Powell is a proud member of the Alpha Kappa Alpha Sorority Incorporated and an active member of the Board of Directors for the Goodness and Mercies Ministries, Inc. She is married to Phillip Powell and together they have a blended family of five children and four grandchildren. Desmond L. Miller is the Development Director for the Boy Scouts of America, Occoneechee Council. As the Development Director, he has been able to connect more underserved communities to the benefits of the Boy Scouts of America Programs. Through his efforts he has developed programs in 12 counties in the triangle area that are challenged locations. He has a passion for teaching people how to swim and the many programs in North Carolina that support learning how to swim. He has given free swim lessons in Charlotte, Wilmington, the triad and the triangle areas of North Carolina. He spends a lot of his off time volunteering with various organizations like, the American Red Cross, Boy Scouts of America, Boys and Girls Clubs, the Durham Rotary, NC Prince Hall Masons and with Phi Beta Sigma Fraternity Incorporated. Mr. Miller is a Graduate of North Carolina A&T State University and executive board member of the Aggie Durham Alumni Association,He has a passion for teaching people how to swim and the many programs in North Carolina that support learning how to swim. He spends a lot of his off time volunteering with various organizations like, the American Red Cross, Boy Scouts of America, Boys and Girls Clubs, the Durham Rotary, NC Prince Hall Masons and with Phi Beta Sigma Fraternity Incorporated. Pernell Briggs, PMP was born and raised in Durham, NC to a hardworking father who was a career brick Mason and a goal driven mother who worked her way from a humble position at Shoney’s to a Human Resources position at GTE. The hard work and vigilance he saw in his parents set the wheels in motion for him to start working as a teenager and become a 1st generation college graduate from The North Carolina A&T State University with a degree in Industrial Electronics and Computer Technology and subsequently an entrepreneur. He began his professional career at Nortel Networks in 1990 where he remained for over a decade working his way up to Sr. Program Manager. It was during his time at Nortel that he started his first entrepreneurial endeavor by becoming a Jeweler. He started by selling jewelry to fellow employees, friends and family members, and as the business grew, was able to open his own retail fine Jewelry Store in northern Durham which remained open for several years. In 1994, he added building custom PC’s, website design and hosting to his list of talents and ran a successful business doing that as well for several years. Recognizing the benefits of having multiple streams of income, he started investing in stocks & options and in 2003 added real estate investing and flipping to his expertise, which he did while continuing to work full-time at Tekelec until 2010. After 2 years working as a consultant for Cisco, and having diversified his investments, Pernell was able to retire from corporate America and focus solely on investing, real estate and mentoring. Pernell currently runs a successful real estate investment and rehabilitation business that services clients in Durham, Wake and all other surrounding counties. His passion is to share his knowledge and teach others how they too can build wealth by establishing multiple streams of income. He resides in Durham with his High School sweetheart and wife of 26 years and his daughter.